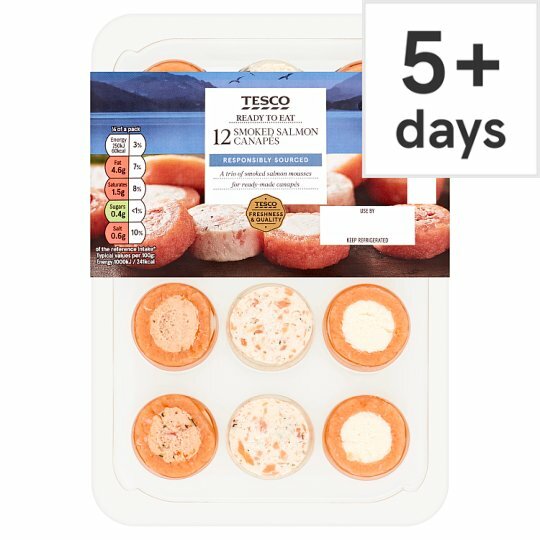 Smoked salmon (Salmo salar) rolls, 4 with full fat soft cheese, salmon and dill, 4 with full fat soft cheese and lemon filling and 4 with full fat soft cheese and semi dried tomato filling. A trio of smoked salmon mousses for ready made canapés. A light, creamy mousse with smoked salmon that's been gently kiln smoked using smouldering oak for robustness and beech wood for a subtle sweetness. Responsibly sourcing our seafood is important to us, which is why Tesco fish experts work with responsibly managed farms and fisheries to continually improve their high standards of quality, welfare and sustainability. INGREDIENTS: Smoked Salmon (33%), Full Fat Soft Cheese (Milk), Water, Salmon (Fish) (9%), Rapeseed Oil, Single Cream (Milk), Semi-Dried Tomato, Cornflour, Fish Gelatine, Sugar, Spirit Vinegar, Canola Oil, Salt, Milk Proteins, Tomato Paste, Concentrated Lemon Juice, Lemon Zest, Basil, Black Pepper, Dill, Garlic, Oregano, White Pepper, Onion, Lemon Juice Powder, Lemon Oil, Turmeric, Pepper Extract. Smoked Salmon contains: Salmon (Fish), Salt, Sugar. Keep refrigerated. Once opened, use within 2 days and by 'use by' date shown. Serve directly from fridge. Turn upside down and press to aid decanting.Tip: For just a few at a time, peel film back per row.